Mondo has announced the next video game soundtrack its bringing to vinyl, and it’s a doozy. This Wednesday, the site will start taking orders for its LP release of the music from Katamari Damacy, Keita Takahashi’s psychedelic cult classic about a cosmic prince rolling up everything on Earth to help replace all the stars in the sky. It sports one of the great modern game soundtracks, an irreverent collection of songs with styles as wide ranging as lounge jazz, j-pop, arena-rock ballads, and of course the uncategorizable frenzy of its famous theme song. In addition to its many posters, collectibles, and film soundtrack pressings, Mondo has been putting out tons of video game vinyl, most notably a series of Castlevania sets that’s been building to Symphony Of The Night, arguably the most beloved of the series’ many fine soundtracks, which should come some time this year as well. As is usually the case with these Mondo releases, the Katamari collection is looking lovely, with a cover that features the little prince looking up at an appropriately imposing rendition of his father, The King Of All Cosmos. 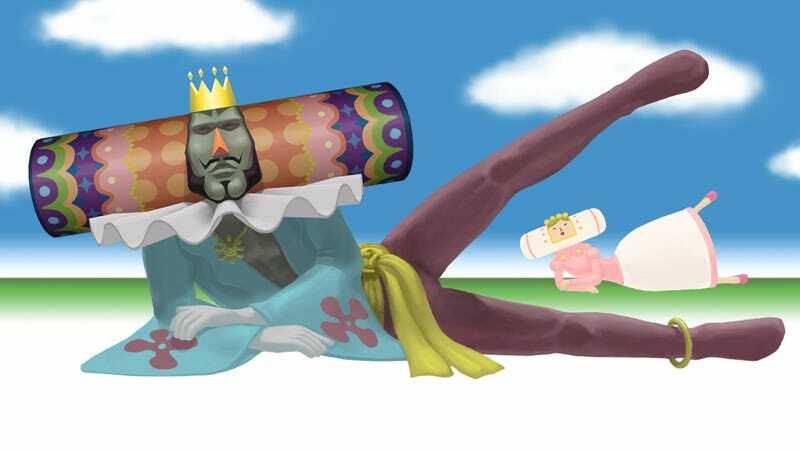 The artwork inside the gatefold, a Katamari-themed takeoff on The Creation Of Adam, is even better.